Our kids will tell you that they have grown up hearing "When someone walks away from you do you want them to feel better or worse about themselves?" Of course they want others to feel better about themselves when they walk away from them. 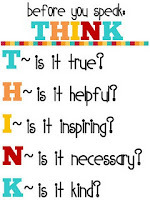 Our goal in saying this to our children is to teach them that their words can and do make a difference in someones life and the importance of thinking before you speak. What a simple rule to teach our kids to think before you speak it can make all the difference. This free printable from Sweet Blessings would be a great reminder in our homes to think before we speak so that our words are an inspiration to others. What a great print! Thanks for sharing!